Energy drinks can provide many benefits. The caffeine and energy blend of a drink may help you stay alert, improve mood, increase cognitive function and give you a short-term boost of energy. Many also provide a significant amount of certain vitamins. However, negative effects may also occur from this type of beverage, especially if you consume large quantities. Some of these unpleasant effects may make you feel unwell or sick. The nutrition facts of an energy drink depend on the specific product. Most of the original energy drinks contain a large number of calories, carbohydrates and sugar. Some brands, however, do offer low-calorie, sugar-free or no-carb energy drinks. Consuming too many calories or too much sugar can cause you to gain weight, and gaining weight may cause health problems that make you feel sick. Because of this, it may be wise to select energy drinks low in calories and sugar. Many energy drinks contain a significant amount of B-vitamins. Often, the amount of some of these vitamins surpasses the recommended dietary allowance. While getting more than the recommended dietary allowance of B-vitamins is generally not a cause for concern, getting too much of certain B-vitamins may cause unpleasant side effects and make you feel sick. For example, getting too much vitamin B-6, especially amounts larger than 100 mg per day, may result in nerve damage. Getting more than 35 mg of niacin may cause a tingling or burning sensation or redness to the skin, known as niacin flush. Other symptoms of a niacin overdose include nausea, vomiting, rapid heartbeat, diarrhea, abdominal pain, itching and liver damage. Although the amounts in one serving of an energy drink are unlikely to cause these negative effects, drinking multiple bottles a day may be problematic. Always check the nutrition label for the specific amount of vitamins in the beverage, read the directions for warnings about how often you can consume it, and call a doctor if you have any specific questions about its safety. The caffeine in energy drinks is typically the main ingredient that causes the positive effects of the beverage, including the increase in energy and alertness. But this same ingredient can also make you sick. Most energy drinks contain between 70 and 300 mg per serving, according to the Centers of Science in the Public Interest. 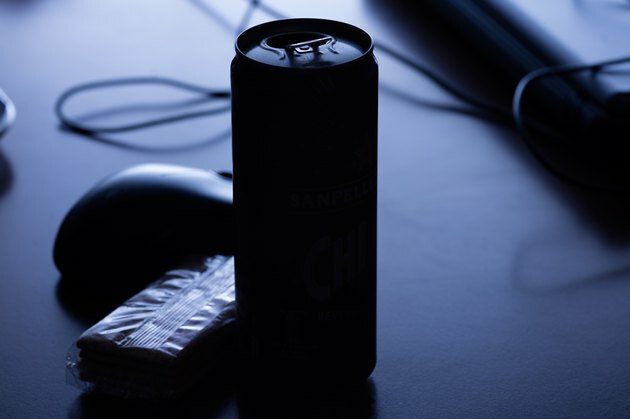 While most people can safely consume up to 300 mg of caffeine a day without experiencing any unpleasant effects, some people consume multiple servings of energy drinks throughout the day. Getting more than 500 mg of caffeine a day may result in adverse reactions, including anxiety, irritability, difficulty sleeping, muscle tremors and gastrointestinal upset. Some people, especially pregnant women and children, may be more susceptible to the negative effects of caffeine than others. These people may have unpleasant reactions to caffeine even when they only consume a small amount. Caffeine may also make a person feel sick when it negatively interacts with certain medications. If you believe that excess amounts of caffeine from energy drinks is making you feel unwell, gradually reduce your consumption instead of stopping abruptly. This will prevent additional negative side effects from caffeine withdrawal. Many energy drinks also contain other ingredients, often referred to as an "energy blend." These ingredients vary depending on the brand and type of drink, but may include guarana seed, panax ginseng, ginkgo biloba, L-carnitine or taurine. While most of these ingredients are believed to be safe in moderation, little is known about how these ingredients affect people who use them excessively or for long periods of time. If you are concerned about the safety of any of these ingredients or believe they may be making you ill, contact your doctor for advice. MayoClinic.com; Can Energy Drinks Really Boost a Person’s Energy? ; Katherine Zeratsky, R.D., L.D.